WAT President John Childs (left) and Trustees Jim Kennedy (right) and David Grohne (pictured) announce their $75 million estate gift commitment for DU's 75th Anniversary. 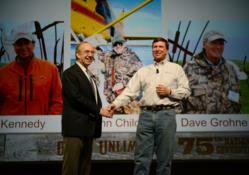 Even though Ducks Unlimited’s 75th anniversary year lasts until December, we are starting the next 75 years right now. Jim Kennedy, John Childs and Dave Grohne ensured a successful and memorable beginning to this new era for DU. By virtually any standard, last week’s landmark celebration at Ducks Unlimited’s 75th Anniversary National Convention in Nashville, Tenn., was a rousing success. Among the convention highlights were a special meeting with Interior Secretary Ken Salazar, redoubling partnership efforts with The Pew Charitable Trusts to protect Canada’s boreal forest and a new financial partnership with Discover. Tennessee Gov. Bill Haslam and Sen. Lamar Alexander addressed the record crowd of more than 1,400 attendees at the Gaylord Opryland Resort and Convention Center, and the convention ended on a high note with a surprise $75 million estate gift commitment from three members of the Wetlands America Trust (WAT) board. Sen. Alexander spoke to convention attendees on Wednesday evening as part of the first-ever DU Family Reunion event and Gov. Haslam followed during Friday morning’s business session. Both men spoke about the importance of conserving Tennessee’s waterfowl and wildlife habitat and other critical natural resources, as well as expressing pride that Ducks Unlimited calls their state its home. A large crowd of DU volunteers, staff and supporters, as well as several members of the local media, gathered for a special ceremony on Thursday morning, as Secretary Salazar signed the 2012 Revision of the North American Waterfowl Management Plan on behalf of the United States. He then engaged DU supporters in a Q&A session about the plan and the future of waterfowl and wetlands conservation in Washington, D.C., and beyond. Later that afternoon, President and CEO Rebecca Rimel of The Pew Charitable Trusts sat alongside DU’s Hall to sign a memorandum of agreement andwith Ducks Unlimited to extended the organizations’ir conservation partnership for another 10 years and vowed to redouble efforts to safeguard Canada’s boreal forest, the largest intact forest on earth, after a decade of unprecedented progress. The work is based on a “50-50” concept that provides strict protections for half of the boreal forest, with sustainable standards applied to the rest. DU and Pew’s partnership is part of a century of U.S.-Canadian collaboration to safeguard North America’s natural resources. Doug Oberhelman, CEO of Caterpillar, WAT trustee and longtime DU member and top philanthropic supporter, spoke on Friday morning about the strength of DU’s brand and the important relationship DU and Caterpillar share through their commitment to conservation and environmental sustainability to benefit future generations. During the final business session on Saturday morning, Discover was announced as DU’s new financial services partner, offering a new line of DU credit cards that benefit DU and the opportunity for all cardholders to donate their Cashback Bonus dollars directly to the organization’s conservation work. The business session ended with a bang as WAT President John Childs and former WAT president and current Trustee James Kennedy took the stage. Along with WAT Trustee David Grohne, each man committed a generous $25 million estate gift to ensure the future of DU’s wetlands and waterfowl conservation efforts across North America. The total $75 million commitment was an appropriate crescendo to an unforgettable 75th anniversary celebration for the organization. Ducks Unlimited is the world’s largest nonprofit organization dedicated to conserving North America's continually disappearing waterfowl habitats. Established in 1937, DU is celebrating its 75th anniversary this year, with special events, projects and promotions across the continent. Ducks Unlimited has conserved more than 12 million acres thanks to contributions from more than a million supporters across the continent. Guided by science and dedicated to program efficiency, DU works toward the vision of wetlands sufficient to fill the skies with waterfowl today, tomorrow and forever. For more information on our work, visit http://www.ducks.org. Connect with us on our Facebook page at http://www.facebook.com/ducksunlimited, follow our tweets at http://www.twitter.com/ducksunlimited and watch DU videos at http://www.youtube.com/ducksunlimitedinc. 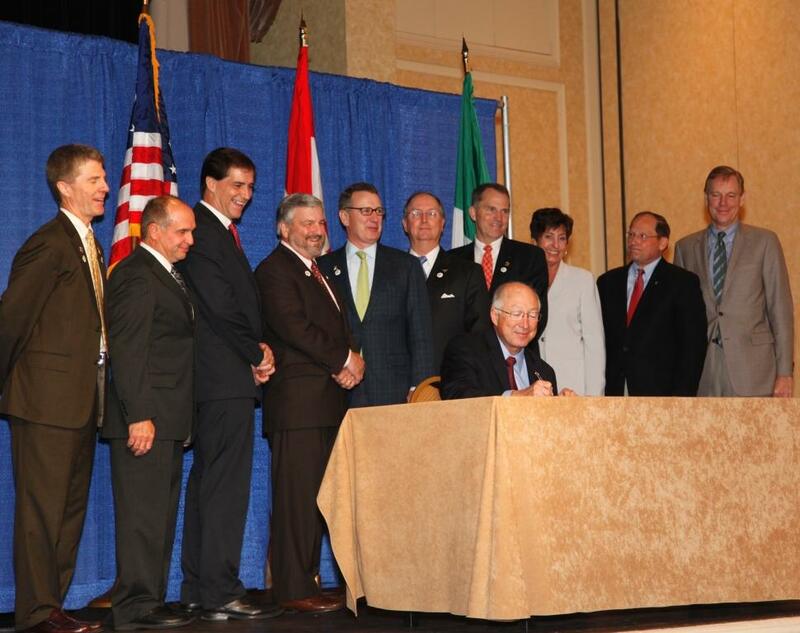 75th DU logo Interior Secretary Salazar (seated) signs the 2012 Revision to NAWMP backed by representatives from DU, USFWS and other conservation partners. 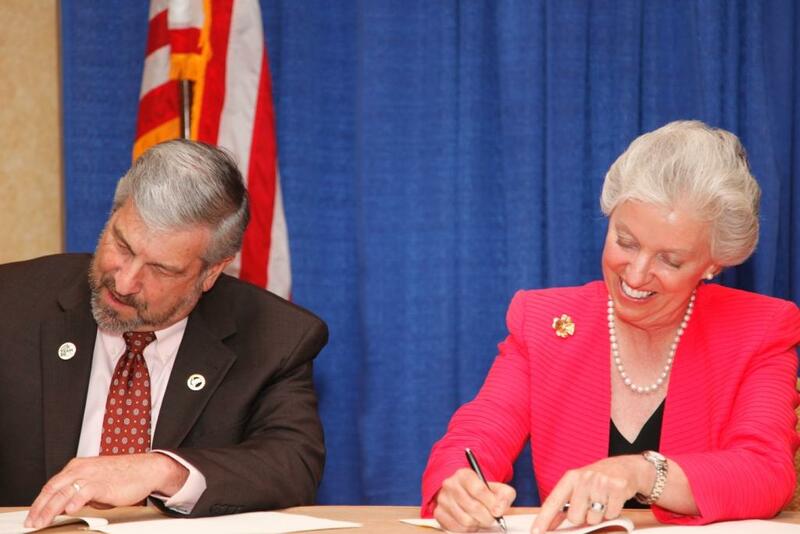 DU CEO Dale Hall (left) and Rebecca Rimel, president and CEO of The Pew Charitable Trusts, sign a 10-year partnership extension agreement.